Just before leaving office, Rick Perry ordered state agencies to start using E-Verify, the federal employment verification system, to make sure job applicants can legally work. But some lawmakers say that mandate isn't enough. One of former Gov. Rick Perry’s last efforts to address border security and immigration doesn’t go far enough for some lawmakers who returned to Austin earlier this month. Just weeks before finishing his term, Perry issued an executive order requiring state agencies under his direction to start checking whether job applicants can legally work in the country using the federal E-Verify system. Perry's order also applied to companies that have, or are seeking, contracts with the state. But despite the directive, which is “in effect and in full force until modified, amended, rescinded or superseded by me or by a succeeding governor,” some lawmakers want to expand the scope of agencies that have to use the system, which is run by the U.S. Citizenship and Immigration Services. State Rep. Greg Bonnen, R-Friendswood, filed House Bill 630, which would require local governments, special districts and agencies not under the governor's direction to also use E-Verify. “The governor’s order can only go as far as an executive order can go, and that’s perfectly fine, but this just expands it to other entities as well,” said Justin Till, Bonnen’s legislative director. Perry issued his order after President Obama’s executive action granting millions of undocumented immigrants a temporary reprieve from deportation proceedings and a work permit. And it marked a change of heart for the former governor, who just a few years earlier said the E-Verify system was flawed and not the right fit for Texas. Even with that endorsement, whether the state’s new leadership is on board to expand E-Verify's scope is another question. Asked about expanding Perry’s order, Gov. Greg Abbott’s office referred to his campaign literature. In his “Securing Texans” plan, Abbott endorsed mandating E-Verify compliance for state agencies. “Doing so will impose no burdens on the private market but will place appropriate checks on the hiring of persons not lawfully present in the United States by public institutions,” Abbott's literature said. But that appears to be as far as the new governor is ready to go. “To be very clear, this recommendation would NOT apply to any other political subdivision, including institutions of higher education, cities, counties, special purpose districts or public schools or public charter schools. This recommendation does not apply to any private sector employer,” Abbott added. Abbott’s office said it wants to engage lawmakers on the issue, specifically on how to enforce the mandate. “Gov. Abbott will work with the Legislature to determine how best to implement his plan and ensure compliance by the agencies,” an aide said in an email. He’s not the only one that wouldn’t mind more input from House and Senate members. But he added that his bill could still serve to open up a dialogue with Abbott. Other lawmakers want to make sure employers won’t get penalized if they use E-Verify and an unauthorized worker slips through the cracks. State Rep. Tony Dale, R-Cedar Park, filed HB 889, which adds protections for employers should USCIS make a mistake. It would only apply to new hires and not current employees. 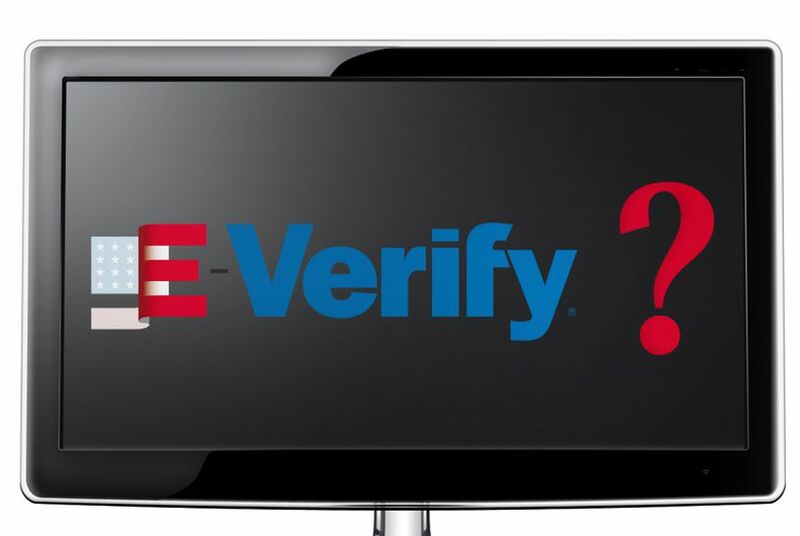 Opponents of E-Verify — including the business community, which argues that the system is still flawed, and immigrants rights groups that say it's discriminatory — won’t have the threat of litigation to thwart lawmakers. In June 2011, the U. S. Supreme Court ruled that states have the right to enact laws requiring employers, including those in the private sector, to use the employment verification system. In that case, Chamber of Commerce of the United States v. Whiting, the court ruled 5-3 that the federal government’s Immigration Reform and Control Act did not pre-empt an Arizona law called the Legal Arizona Workers Act, which passed in 2007. The law allows the Arizona government to revoke the business licenses of employers who knowingly hire illegal immigrants, and mandates the use of E-Verify.